The Kosovo battle can be classified among those events which, in the true sense of the word, have been fixed in people's memories. Participants and contemporaries, as well as their heirs, talked about the great bloodshed. Just a small part of the story, which had been told and sung, remained in written form and was preserved for future generations. That preserved part forms a long and rich tradi­tion, composed of numerous and various gen­res and forms of presentation, such as echoes in contemporary letters, historical narratives and detailed epic poems. Taken all together, the texts represent a very important tes­timony to the Kosovo clash, to the power and duration of the tradition. But, taken in such a way, they cannot be used to establish the cir­cumstances under which the battle took place, or to define its most important mo­ments. Among all these sources, there are those - not just a few - which were created very late, with very poor information, there are legendary ones also, and additionally those in which we can recognize the colour of later-times experience. Six weeks after the battle, the Venetians sent word to Murad's heir Bayezid, mentioning that "various matters, which cannot be easily believed", had been circulating about the war between his late father and Prince Lazar. From some other sources, we also get to know that, the letters and rumors on the Kosovo battle were not all correct and in agreement. These differences were even greater in testimonies written later. The Byzantine historian Laonik Halkokondil, a few decades after the battle, testified expressly that "the Greeks" i.e. Christians, had one, and the Turks - another version of the death of Murad. In the Turkish version, Murad had been killed when he had already won the bat­tle. The disparity between the reports and stories was not a result of the inadequacy of technical means at the end of XIV century, but because the rumors reflected the attitudes of some of the participants, because they had conveyed only a part of what had happened, and be­cause the majority of the reports, from the very beginning, were coloured by partisan at­titudes. In later representations, the versions from the standpoint of later experience were expressed fully, but different to those from 1389. Only after 1459, when the Serbian state had collapsed, was it possible to attach to the Kosovo battle, the importance of a vital turn­ing point, and add the conviction of "failure of the Serbian empire". It was inevitable this change in the traditions of the Kosovo battle, as well as their transfor­mation under the influence of living cir­cumstances and the ideas of further genera­tions, modified by their particular apprehen­sion of values. The recognition of the ideas of a later period, is a necessary prerogative for approaching a realistic picture of the battle as a great and important event. A critical ap­proach to the Kosovo battle must be based on a division between well informed and truthful, and less reliable and legendary sources. But critical research must not underestimate or exclude narrations from a later period, as they can throw light on the mentality of the times, in which they were created, and also because they are very important for preserv­ing a people's consciousness of its own history. It is natural that scholars and the general public are interested primarily in the concrete circumstances, in which the Serbs and Turks clashed, but it is also quite natural to preserve an interest in the changes within the tradition. It is interesting to search for the personality of a soldier who killed the Turkish ruler Murad, but it is more challenging to reveal how the views on him changed - how, from a knight at the end of XIV century, he became a mythical personality of super­natural power. A contemporary historian does not have any reason to oppose history to tradition in con­nection with the battle, as the study of former histories has shown him that both get equally interesting and significant tasks, which he must solve by a variety of methods and forms of research. No matter whether he has chosen one or the other way, he must pay attention to the time and circumstances in which some of the sources have been created. It is not possible to draw a clear and sharp line be­tween the sources which speak of the event, and the sources which throw light on the event's tradition, as it is possible that some correct contemporary detail appears in a later source and is found only there as well, as it is possible that some unfounded rumor is con­nected to the first months after the battle. However, we must divide the sources of the battle from the sources of tradition, mostly to avoid the distortion which can occur under the influence of a later period. The example of Turkish sources, made a whole century after the battle, serves as a warning; it gives the ways of fighting, types of armament, and even the most important Turkish enemies, repre­sented in the light and experience of the end of XV century. 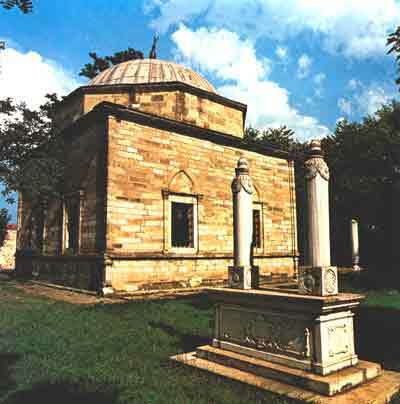 That part of the Kosovo field where Murad's turbe /tomb/ is placed, the place where Murad's entrails had been buried, and which remained marked constantly, although the present monument dates from a later period. As "Murad's grave", the turbe is marked in XVI century maps. The other object, the "great marble column", built on the spot where Prince Lazar was caught, is not preserved on the field. The majority of contemporary and most an­cient sources put the battle into the framework of the war between the Serbian Prince Lazar and the Turkish emir Murad. Some rhetorically coloured texts tell of the battle between the Christians and Moslem in­fidels, but one letter from the Bosnian King Tvrtko I /1353-1391/ sent to the Municipality of Trogir on 1st August, 1389, and the answer from Florence to the letter of the same King /20th October, 1389/, reveal that King Tvrtko had informed his friends and allies, that he had defeated "the Son of Satan and a servant" of Murad. A detachment of the Bos­nian King, without doubt, took part in the Kosovo battle. Some of his warriors were killed there, the others were taken prisoners and transferred to Turkey, and their families, helped by the Dubrovnik go-betweens, did their best to free them. The explanations for these certainly authentic letters, in which Prince Lazar was not mentioned, and the number of Serbian casualties was minimized, can be found in Tvrtko's legislative principles. In 1377 he himself, as the heir of his oldest ancestors - "Serbian Lords", had himself been crowned by "a double crown" as "Stefan, the King of Serbs in Bosnia, the littoral Pomorje and Western areas", and saw himself in the role of the Serbian ruler, on the throne of the Nemanjics, who - long ago "ruled the Empire" and then "moved to Heaven". His real power was limited to the inherited Bosnia and the Nemanjic territories gained in 1373, 1377 and 1385; in the territories of Prince Lazar and Vuk Branković, he did not have any power, but, he had been accepted, certainly, as a high rank ally because of his King's title. So, he did not without reason represent himself as a Serbian ruler, as he had been one - by his detachment represented in Kosovo - but the basic perspective of his share in these affairs has been altered. 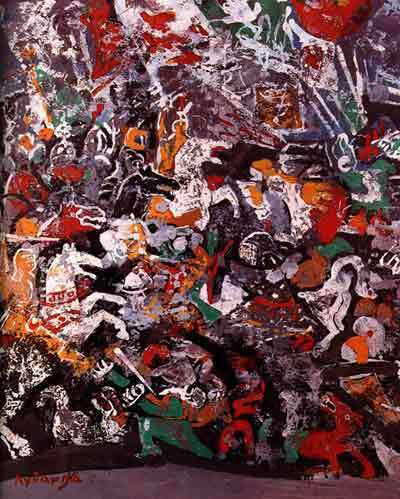 It is also positive that Vuk Branković, in whose territory the battle took place, took part in it. On the Turkish side, there was Murad along with his two sons, one of whom was killed in the battle with his father, according to the most ancient reports. The Sultan was followed by vassals, those from the South-Slav and Byzantine areas, but their names were not mentioned till the end of XIV century. For the study of the circumstances under which the Kosovo battle took place, the very important fact is that Murad did not possess common frontiers with territories of Prince Lazar and Vuk Branković, and that he was separated from them by the belt of territories of his vassals in Bulgaria, South-Eastern Ser­bia and Macedonia. That is why the territories of Prince Lazar and Vuk could not come directly under the rule of the Turkish govern­ment, while the territories of Dragaš or Vukašin's sons were not transformed into Turkish sanjaks, in 1395. On the other hand, the rulers of Hungary, Bohemia, Germany and some others, could not enter the Chris­tian camp, as later Turkish sources revealed, for Tvrtko I was, at that time, in severe dis­pute with the Hungarian King-Sigmund of Luxemburg /1387-1437/. Tvrtko supported the King's rebels, conquered parts of Croatia, and managed to subjugate Dalmatian towns. In his negotiations with Split, he allowed it to be the last of the towns to surrender to his power, and it was done on the same, St. Vitus Day, in 1389. On the other hand, King Sigmund decided on the month of July, of the same year, for gathering an army against the Bosnian ruler. In the summer of 1389, Tvrtko and his allies fell between two fires, and the practical realities of this situation are rather remote from the romantic view of sacrifices for the defence of Europe. Restricting research to the most ancient sources does not help too much in efforts to establish the number of warriors in the Kosovo battle. A contemporary, French knight Philippe Messier, in his epistle written after the Nikopolis battle, in 1396-97, wrote that both the Turks and Prince Lazar had lost 20.000 soldiers. Being aware of the disability of people in the Middle Ages to estimate ap­proximately at least the number of soldiers, animals, goods or money, we must be very suspicious of Messier’s information. In some later sources, even greater exaggerations can be found: that there were a hundred thousand Serbs, and three hundred thousand Turks. The official data on military power, from the middle and the second half of XV century, might give a somewhat realistic appraisal and approximate scale of values. From one, fre­quently checked document on the military power and Sultan's incomes dating from the period of Murad's great-grandson, a great conqueror Mehmed II /around 1475/, we know that the Sultan, from the European part of the territory - an area that was much larger than that of the countries of those who directly, as vassals, took part in the Kosovo battle, could raise 20.800 cavalrymen-land­owners. A few decades earlier, a Serbian Despot, whose territories were approximately that of Prince Lazar and Vuk Branković's ter­ritories, in a plan for the defence of Hungary against Turkish attacks, had an obligation to raise 8.000 cavalrymen, while the Bosnian King and three feudal lords gave 9.000 caval­rymen. It is not possible that either one or the other side had greater potential during the Kosovo battle. In most ancient sources, there are few details on the course and most important moments of the battle. In the above mentioned reply of the Florence Municipality to King Tvrtko, Murad's death was mentioned along with the congratulations for victory "gifted by Heaven". There, the feat of twelve noblemen, who, gathered by mutual oath, made their way to Murad's camp, and where one of them thrust a sword into the ruler's throat and loins, was praised. In that letter, written on the basis of the King's message and of the facts heard and known from rumors and letters only four months after the battle, the historical basis of the event, which would be talked and sung about in future centuries, lies. It is not pos­sible to conclude from this, most ancient source, anything of the hero’s personalities, and we cannot even tell to which part of the army he belonged - Lazar's, Vuk's or Tvrtko's. Only in sources a decade later is his name - Milo or Miloš - mentioned. From the most ancient sources, we get to know just a few facts about Prince Lazar's death. He was probably killed during the typical Turkish slaughter, after the battle, as a sign of revenge for their killed warriors. The texts from the later period, undoubtedly, speak of Turkish victory and Christian defeat, and even in Serbian tradition this defeat was connected to the "collapse of the Serbian Em­pire". On the contrary, in the most recent sources we find a view that the Turks were defeated. Some of the sources are very explicit in this assertion, and this can be concluded from some others, indirectly. This difference sharpens the gap between the tradition and critical history, and raises some basic ques­tions as to methods of forming opinions and discussions in history. In order to understand and explain differences of narrative in our sources, we have to ask ourselves what was the basis for earlier centuries' criteria of suc­cess of the battlefield - fewer number of casualties, power over land, exploitation of the aftermath of a battle, the number of cap­tured enemies, booty or some other factors, which are not important today? We also have to ask whether it is easy to establish the im­portant facts: that the ruler or commander's death was more significant, among warriors, than the number of casualties, which is very difficult to define. 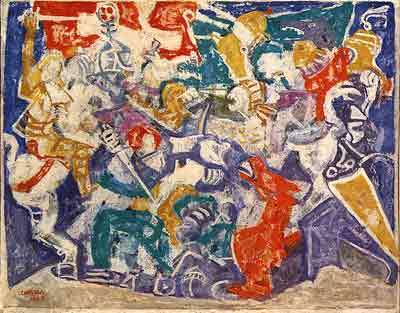 According to the mediaeval understanding, the management over a bat­tlefield, remaining there when the enemy was forced to run away or withdraw, was one of the most impressive signs of a successful end to a battle. This seems very easy to establish. But, if a battlefield was in a country of the enemy side which had been forced to abandon its territory and if the one who remained the owner of the battlefield, after a short period, started moving back to his own country, mat­ters would not be as clear as it seemed, at first sight. Would the conditions immediately after the battle be remembered, or the ones established later, after the departure of the real winner? In that case, there would be the possibility of exchanging roles. If the result was judged according to which side had benefited from a battle's then later events should be taken into consideration; this opens up the possibility of distortion of the battle, under the influence of later perceptions. These open questions and perplexities remain even after centuries of critical study of the Kosovo battle, and even with a widening of the field of sources and clearer understanding of the situation after 1389. Instead of short and reliable replies, a critical historian is obliged to convey to a reader his doubts and to go through all of them. It is quite certain that a number of the most ancient sources testify generally to the battle, emphasizing Murad's death. The ruler's death threw a shadow onto the Turkish side. But, the Turkish tradition, emerging much later, was not influenced by it. We have already mentioned that Tvrtko's letters represented his legislative views, ac­cording to which it had been his battle and, as the enemy ruler had been killed and the army, under his successor had withdrew from Ser­bia, Tvrtko didn't have to "embelish" the af­fair, so that it was represented as his victory. However, his correspondents, informed from other sources, accepted the version of his tri­umph. Vuk Branković remained in his own country and didn't reconcile with the Turks up to 1392, so it could be concluded that the battle result hadn't been questioned. He got the chance to fill in, by his personality, the gap which arose by the disappearance of Prince Lazar. The family and territories of Prince Lazar were the most affected by the consequences of the Kosovo battle. The ruler had been killed, and the country came into the hands of a widow and weak sons. In the autumn of 1389, the Hungarian King Sigmund invaded their territory along with a huge army, which har­dened their position towards the Turks. Con­trary to the writers of hagiographies and praises to Prince Lazar, who saw him not only as a hero crowned by religious martyr­dom, but also as a "new David" - which meant - a victor aided by God, the Prince's son Stefan remembered the conditions after his father's death in a much more gloomy light. In the preface to the Law on Mines /1393,1412/ he mentioned that in the begin­ning of his rule "the infidels attacked the Christians", that he saw "a great victory of my country"; also, how, following the advice of patriarch Spiridon /died on 18th August, 1389/, other Bishops and his mother, he had gone to "the great emir Bayezid", and how, according to the latter's requests, he had liberated the country and towns - which un­doubtedly meant that he had become Bayezid's vassal. Lazar's heir claimed that his destiny had been decided by the consequences of the Kosovo battle. The most important fact for understanding the differences among the most ancient sources was that not all the participants were affected by the Kosovo bat­tle in the same way, and so it is quite normal that they experienced it and talked about it in different ways. Knowing, generally, the further development of Serbia, and bearing in mind the leading role of Stefan Lazarevic after 1402, and also know­ing that the long-term hostility between the Lazarevićs and Brankovićs as Stefan's heirs /1412/, remembering how Zeta had fallen to Stefan as an inheritance /1412/ - we can easi­ly understand why the views of Lazar's heirs predominated and gave a mark to the whole of future Serbian tradition. In the narration of Konstantin Philosopher, a biographer of Despot Stefan, we can recognize attempts at a recon­ciliation of the two views: "Lazar's forces at first resisted the attacks and prevailed. But, the hour for rescue was expiring. That's why the son of the Czar became strong and won that very battle, as God allowed /.../". But this could be classified as a study on the develop­ment of the tradition of the battle, which is another different but very attractive task.